Zena Pare of Alvaton, Kentucky, was captivated by American Sign Language from an early age. As a young homeschooler she learned the alphabet and basic signs. Even as Zena grew older, she kept studying sign language and couldn’t seem to get enough. The opportunity to be taught by an ASL professor and certified interpreter at the local university encouraged Zena to continue homeschooling through high school. After taking ASL 1 and 2 for high school credit during her 8th and 9th grade years, she dual-enrolled at Western Kentucky University in 10th grade. Zena took several classes at WKU as well as the local community college, maintaining straight A’s while earning 43 college credit hours through dual credit and AP exams. In her sophomore year she scored 32 on the ACT, which placed her in the top five percent of students who take the exam. Her other academic honors include being a Governor’s Scholar and National Merit Scholarship Corporation Commended Student. 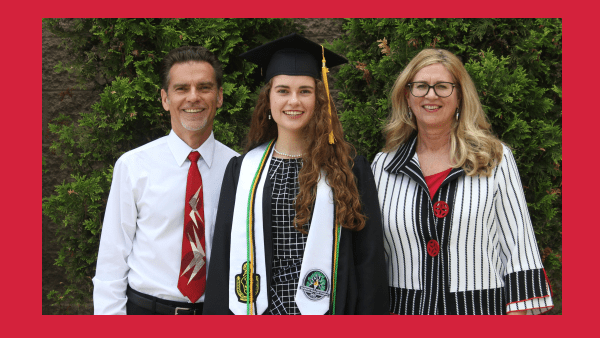 These academic achievements, along with her extensive list of community service and extracurricular activities – including Girl Scouts, dance, and Eta Sigma Alpha Honor Society – earned Zena a generous scholarship to continue studying at WKU. She was one of 16 students selected to receive the 2018-19 Cherry Presidential Scholarship, the school’s most prestigious academic award. To practice her skills, Zena has volunteered at a camp for deaf and hard of hearing children, helped with events at the Kentucky School for the Deaf, volunteered in the children’s program at DeaFestival in Louisville, and helped sign the national anthem for university sporting events. She has already completed the ASL Studies minor at WKU, and is now working in the school’s ASL lab where she tutors other students. WKU’s American Sign Language Studies minor prepares students for intercultural and linguistic exchanges in everyday life, and instills respect for the culture and language of Deaf and Hard of Hearing individuals. The program provides comprehensive and challenging opportunities in which students can learn and grow through a variety of immersive classroom and community experiences. Faculty, staff, and Deaf community members teach, guide, and support students as they learn communication competency using a complex visual language. While a minor in American Sign Language Studies builds a solid foundation of ASL language and skills, it does not lead to interpreter or Deaf Education certification. Students like Zena choose to minor in ASL as they prepare for a variety of career fields. An ASL minor may be of particular interest to students in Speech and Hearing Sciences, Education, Social Work, and Nursing. Zena is actually majoring in Biology, and plans to attend medical school with the hopes of becoming either a radiologist or dermatologist. For more information about American Sign Language, click here.